I wouldn't think it is news to most people that there are a higher percentage of women in the workforce today than in previous decades. 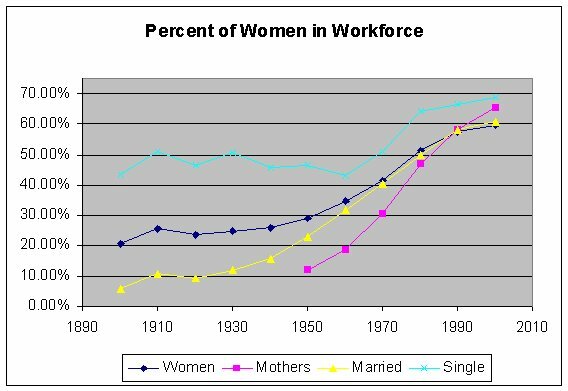 I recently ran across someone on the 'net who seemed to think that that it was more common for mothers to work in the 'olden day's and that high % of women working is not a new thing. 1. Historical Statistics of the United States Colonial Times to 1970 has a lot of census data covering the nations history. The document was put out for the US Bicentennial so it only covers up to 1970. 2. For more recent data the BLS.gov site has statistics on Labor Force participation of women and mothers from 1975 to 2008.
the Civil War has information as well. But that data is extrapolated rather than straight census information. 4. 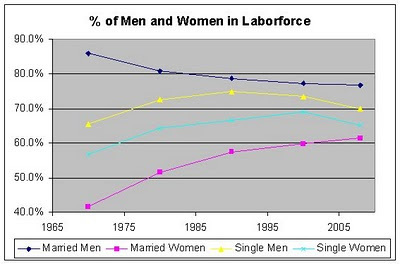 The Census statistical abstract has later data on married women's labor force participation. From 1900 to 1950 there was gradual change. Single women worked at rates around 40-50% in the first half of the 20th century. The rates for women as a whole started at 20.5% in 1900 and had climbed to 29% by 1950. The increase of married women who worked was the highest gain. In 1900 only 5.6% of married women worked but by 1950 there were 23% working. Post 1950 through 2000 the percent of women working increased very quickly. The % of women working went from 29% to 59.9%. Married women working was 23% in 1950 and hit 61.1% by 2000. Single women working went from 46.3% to 68.9%. The most drastic increase was among mothers which went from a mere 11.9% in 1950 to 65.3% in 2000. I also drew out a graph showing some more data going back to 1800. 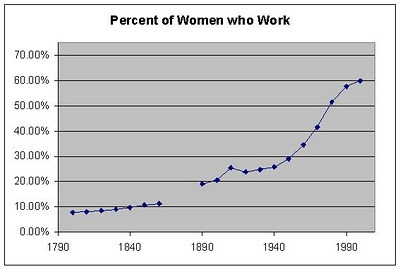 In this chart we've got the percent of women who work from 1800 to 2000. The data for 1800 to 1860 is from the #3 source listed above. There is a gap from 1870-1880 but the trend from 1800 to 1900 seems clear and we can assume the figures for 1870 to 1880 are in between at about 14% and 16% more or less. As you can see the percent of men has been going down at the same time that the percent for women has increased. As of 2008 there was only about a 5% difference between the single men and women and a 15.4% delta between married men and women. 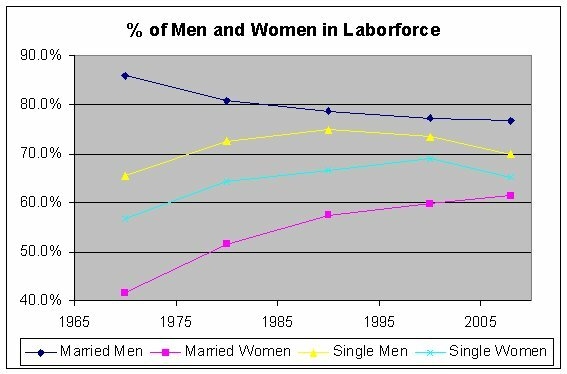 It seems if the trend continues then eventually the numbers will converge so that roughly equal percentages of men and women participate in the labor force. Note : You might notice some odd and apparently contradictory differences in the numbers. For example more mothers work than married women. Part of this is due to demographics such as more mothers being younger women who are more likely to work than older women. I would also point out that there is a group of women that is counted separately in some of the data which is the widowers or married women whos husbands don't live with them. That group works less than the other categories of married, mothers or single.